Spider mites, often referred to as red spiders, are not insects but are among the most serious of pests to ornamental plants. These are very small pests, less than 1/50 of an inch, and may be difficult to see without the aid of a magnifying glass. They may be found on both the under and upper sides of leaves and may not be detected until high populations have occurred. Infested plants exhibit a speckled appearance on the upper leaf surface resulting in a silver or bronzed cast. Spider mites have needlelike mouthparts that are used to puncture the leaves. Adult females may be greenish, yellowish, or reddish and may have dark spots on either side. Eggs are laid singly, at random, on leaves. Adult females can lay several eggs per day and may produce 50 - 100 eggs in their lifetime. 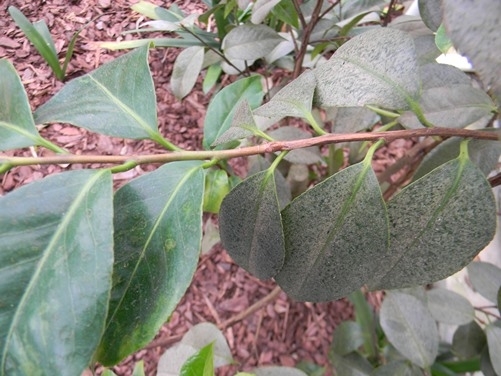 Three species of spider mites attack camellias: the Southern Red Spider Mite, Oligonychus ilicis, the Tea Red Spider Mite, O. coffeae, and the Twospotted spider mite, Tetranychus urticae. The Southern Red Spider Mite is the most common in the Southeast. The Southern Red Spider Mite develops best in cool weather, reproducing primarily in the spring and fall. The opposite is true for many other species of mites which prefer hot, dry weather. A single spray of acaracide (miticide) in the spring will usually prevent severe injury. A second and third application, both at seven day intervals, should be made to kill those mites which hatch from eggs laid before and possibly after the first spray treatment. Use of an acaracide is much more effective in controlling mites than a general insecticide. Often, some control may be obtained by spraying foliage with a hard spray of water.